We love our nurses! Global Health Reach (GHR) understands that nurses often provide front-line care in clinical settings in the United States. This isn’t different in the field! 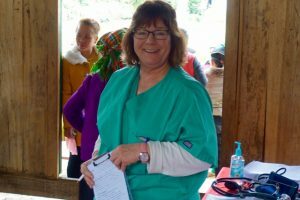 They fill a variety of crucial roles during GHR medical mission trip clinics. This post outlines just a few of the many possibilities. Returning to the same area gives the unique opportunity to witness the health of an entire community improve over the course of years. We get to bring the primary care office to a community and the patients will develop a deeper trust with volunteers and providers that consistently show up for them. Continuity of care is so important to achieving long term health goals for people and GHR makes it a point to hone-in, and pour everything they have into a few communities instead of sprinkling a little over a large number. It is through that persistent focus and dedication that you see powerful impacts being made on the lives of the people you are serving. This post only begins to describe the many roles that nurses fulfill in the field! Many of the skills and roles are intangible. GHR understands that and wants to let you do the job you’re best at! Interested in learning more about nursing opportunities? Check out our upcoming trips and don’t hesitate to contact us via the form below.